GURNER™ has won its appeal in the Supreme Court to overturn a recent decision by VCAT that denied its proposed redevelopment of Johnston Street’s The Spanish Club, Hogar Español, a permit, due to the developer being “denied procedural fairness”, according to the judge. The proposal was denied a permit at VCAT in May this year on a technicality surrounding the location of an exhaust flue on a neighbouring property, despite the project having overall support from VCAT. The proposal would see the 787sqm site transformed into a new Spanish bar and restaurant with clubhouse facilities at ground level and apartments occupying the 5 – 6 levels above. After successfully mediating with all objectors except for one, GURNER™ was denied a permit due to an adjoining property owner’s refusal to negotiate a new location for an exhaust flue on the shared boundary, which was in contravention of all EPA guidelines. According to GURNER™, in its current location, the VCAT Member ruled in April that the flue was in an unacceptable position for the proposed development, however after numerous attempts by the developer to find a solution with the adjoining owner, he was not willing to negotiate the exhaust’s relocation elsewhere on site. GURNER™ appealed the decision in May, lodging papers with the Supreme Court. Justice Karin Emerton found that Mr Gurner was “denied procedural fairness” as the tribunal did not give the developer the opportunity to call on expert witnesses, challenge evidence or make further submissions or rebuttals. "I consider that it would create the appearance of prejudgement and unfairness to the applicant were the matter to be remitted to the same tribunal,"Justice Emerton said. 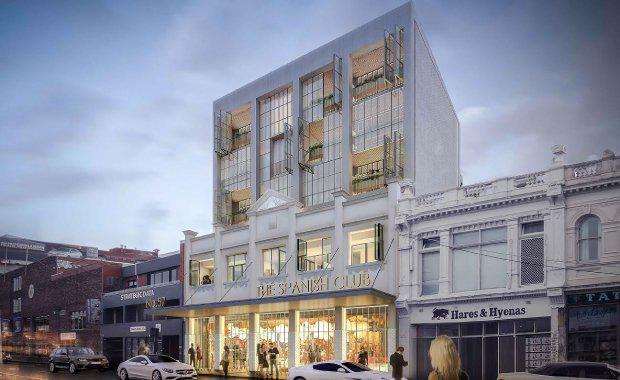 The case will now be re-heard before a different member of the tribunal, meaning the developer’s plans for the redevelopment, and the survival of The Spanish Club, remain alive. “ This week’s ruling by the Supreme Court was a huge relief and we are ecstatic that due process has in this case prevailed,” said GURNER™ founder and director, Tim Gurner. “ It is becoming increasingly difficult for developers to navigate the complex planning environment, especially when what is acceptable for one development is then not acceptable for another. “ All we ask for as developers is a fair and transparent process to follow; the Supreme Court win has reaffirmed that for us and we are excited to be able to keep our plans alive as a result. “ This proposal has been over four years in the making. The club first approached a number of developers to submit tenders to redevelop the site of the original Club, while creating new clubrooms and retail facilities that would allow them to reposition their business model and remain commercially viable. “ We were thrilled to have been awarded the tender in 2015 and have been working incredibly closely with The Spanish Club, council and external stakeholders since then to come up with a scheme that will not only allow the Club to survive, but thrive in the face of a changing market. “ We were absolutely devastated when the proposal was denied a permit last month based on such a crazy situation where we have a neighbour who is non-compliant with EPA guidelines refusing to attend to the issue and at the same time wouldn’t agree to us moving the flue, so we are just so pleased this decision will allow the vision for the project, and the Club, to remain in viable while we resubmit the proposal to another VCAT tribunal,” he said. Under the proposed agreement between The Spanish Club and GURNER™, the developer was to absorb the Club’s debt and transfer ownership of that debt into the developer’s name to ensure that the banks could not pursue the Club for costs whilst the redevelopment was ongoing. Established in 1969 along Fitzroy’s effervescent Johnston Street, The Spanish Club was founded by Padre Eduardo Sanchez, the Chaplin to the Spanish, who persuaded the Spanish government to partially assist in purchasing the building to serve as a social centre. The club was originally called The Spanish Roman Catholic Mission, before later being renamed ‘Hogar Español’ meaning Spanish home. One of Johnston Street’s most iconic venues, The Spanish Club has become synonymous with Fitzroy’s celebrated multi-cultural heritage and has played a pivotal role in the area’s vibrant character, most notably one of the founders and initial trustee of the annual Johnston Street Festival.